Recent discoveries of water and Earth-like soil on Mars have set imaginations running wild that human beings may one day colonise the Red Planet. However, the first inhabitants might not be human in form at all, but rather swarms of tiny robots. 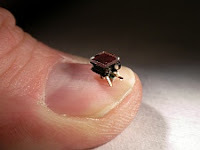 “Small robots that are able to work together could explore the planet. We now know there is water and dust so all they would need is some sort of glue to start building structures, such as homes for human scientists,” says Marc Szymanski, a robotics researcher at the University of Karlsruhe in Germany. Szymanski is part of a team of European researchers developing tiny autonomous robots that can co-operate to perform different tasks, much like termites, ants or bees forage collaboratively for food, build nests and work together for the greater good of the colony. Working in the EU-funded I-SWARM project, the team created a 100-strong posse of centimetre-scale robots and made considerable progress toward building swarms of ant-sized micro-bots. Several of the researchers have since gone on to work on creating swarms of robots that are able to reconfigure themselves and assemble autonomously into larger robots in order to perform different tasks. Their work is being continued in the Symbrion and Replicator projects that are funded under the EU’s Seventh Framework Programme. Planet exploration and colonisation are just some of a seemingly endless range of potential applications for robots that can work together, adjusting their duties depending on the obstacles they face, changes in their environment and the swarm’s needs.